For free modelling in Styrofoam. No "crumbling" as when working with knife and sandpaper. 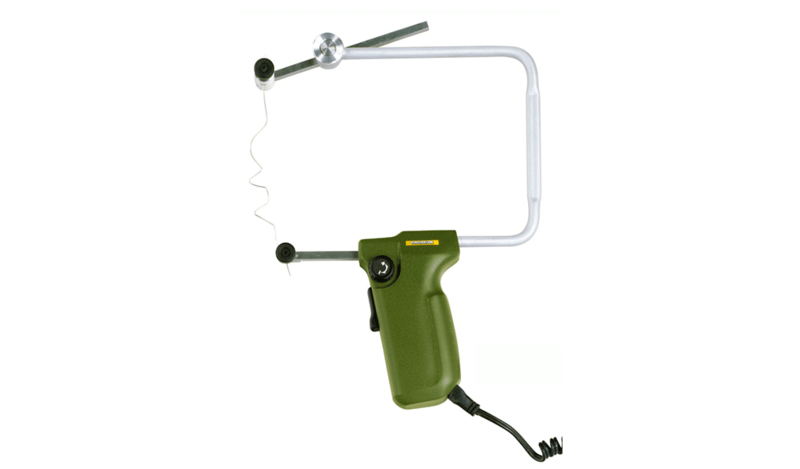 Cutting wire 11.4" x 20 gauge (285 x 0.85mm) can be formed by hand or with pliers to cut any shape or profile. Extendable wire fixture. Maximum extension 7.9" (200mm). Polarity-protected system plug for MICROMOT transformers. 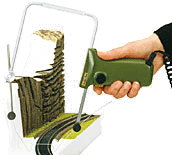 For free hand cutting in thick Styrofoam for diorama model railroad construction of any shape. Architecture modelling, prototype construction, for designers, decorators, or for fine work on construction insulation. And of course for classical model building. Stable frame with pivotal fixture at the top and extendable lower wire fixture. Maximum extension 7.9" (200mm). Maximum work piece height 5.9" (150mm). Variable cutting wire temperature control. With a little practice, you can achieve perfect cuts depending on the material density and thickness at medium temperatures and with moderate pressure. Heat up time is 1 second. Comes with 5 shapable cutting wires. 12 V. 60 W. 50/60 Hz. 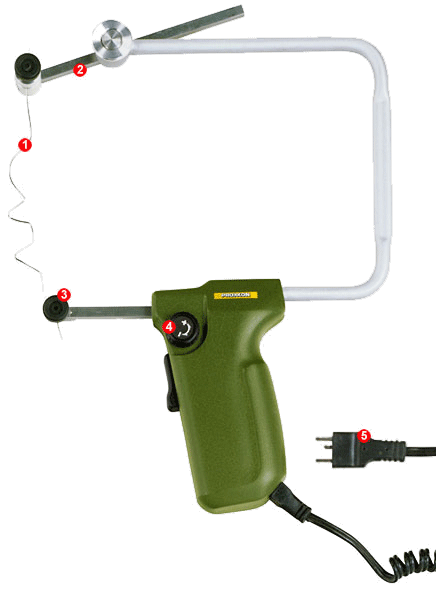 Variable cutting wire temperature ranges from approx. 300 - 660 °F (150 - 350 °C). We recommend the use of our MICROMOT transformer NG 2/S for operation. This product, when used for cutting, can produce fumes or gases, which can contain chemicals known to the State of California to cause cancer and birth defects or other reproductive harm. For more information go to www.P65Warnings.ca.gov. With a bit of practice, creating landscapes even for finished railroads and streets is easy. It is also no problem to make corrections to model landscapes. Styrofoam is an inexpensive material and very environmentally friendly when compared to other materials and can be easily cut with a hot wire. For the THERMOCUT 12/E. Easy to bend, therefore ideal for modelling.